Used Mocon Mini-Mover Pneumatic Transport for Tablets and Capsules. Serial #0992065. Unit is designed to transport almost any tablets or capsules without set up of special adapters. Comes with a Stainless Steel cone with adjustable hose. Cone to be placed under discharge chute of tablet press or capsule filler for continuous feeding into totes, drums etc... Minimum Height: 17" from floor. Maximum Height: 34". 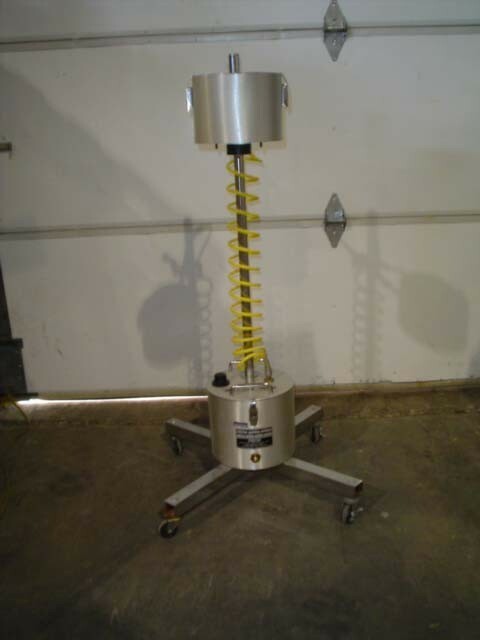 Comes mounted to a 26" diameter base on castors and weighs approximately 30 pounds. Unit requires 100 psi at 21 cfm air. Last used in a large pharmaceutical facility. Delivery Time: Immediate.